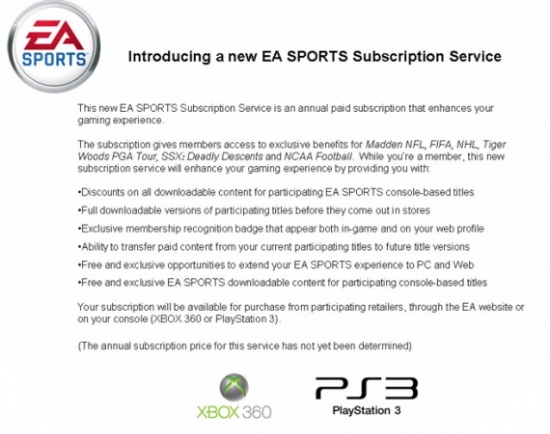 The first thought when the idea of a “subscription” is breached may be to assume it relates to online play. In this case it does not appear to have anything to do with online access as the company already has the “Online Pass” implemented. Instead this service would be framed as an optional value add-on of highly desired features and perks that could be had for a yearly fee. 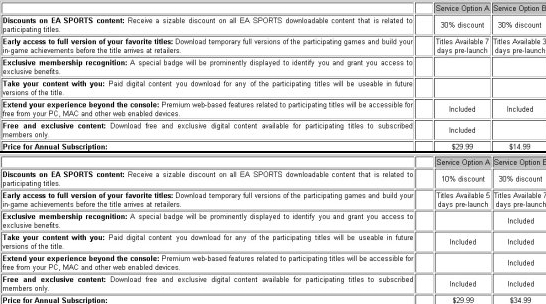 The ability to carry over downloadable content from one year to the next would be well received. That in particular would come in handy with a series such as Tiger Woods considering the cost of all the courses being offered as DLC. Its already difficult to expect consumers to shell out $110 for the complete Tiger Woods 12, but especially so when knowing those same courses would have to be re-bought come Tiger 13. Even more intriguing would be the ability to download full games before the street release date. Moore has made it clear that the industry is going in the direction of digital distribution and this would be a way to wean consumers onto the prospect of purchasing the games in a manner that may still feel foreign to many. The reaction to this “subscription service” would likely be positive given the features being delivered are of real value while not restricting what consumers already have come to expect out of these games. Essentially this would appear, on the surface at least, to be a win-win though much of course depends on what the charge for such a service will ultimately be. 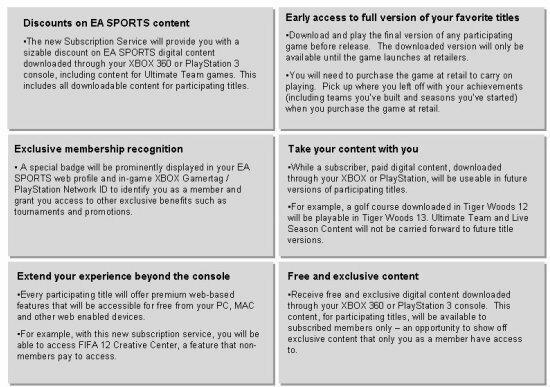 Update: A survey circulating in regards to the potential subscription lists annual prices ranging from $14.99 to $34.99 depending including all the advertised options, the extent of the discounts, and up to a full week in advance to download games before they arrive in stores. Possible plans to be offered below.